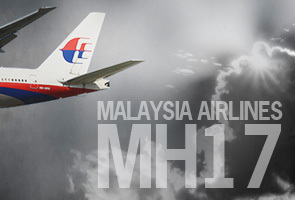 MH17, was flying from Amsterdam to Kuala Lumpur when it went down in Ukraine. SEPANG: "My brother was very excited to be back for Raya with the family and should have arrived today," said Md Zaki Md Salim, the elder brother of one of the passengers of Malaysia Airlines flight MH17 that crashed in Ukraine. He said his brother Md Ali, 30, was furthering his studies and preparing a thesis on Psychology Studies at the doctorate of philosophy (PhD) level at one of the universities in Amsterdam. "After receiving the news from my elder sister, I rushed to the airport here and MAS side confirmed my brother was one of the passengers of that flight," he said when met at the Kuala Lumpur International Airport here. He said Md Ali was the sixth of eight siblings and should have returned for the Raya holidays in their kampung in Muar, Johor starting from today. A week prior to the incident, he said his brother had chatted with him on the Facebook social web and wanted to buy trousers and shoes for each family member in Armsterdam. "He even managed to ask for our sizes for the items to be purchased," he said. The MAS flight, MH17, was flying from Amsterdam to Kuala Lumpur when it went down in Ukraine. It was carrying 283 passengers and 15 crew.